Just a quick note that may help early adopters. The new (v4) Adonit Jot Touch stylus doesn’t pair the way the old one (v2.1) did. If you have problems, don’t use the ipad’s bluetooth screen. Just make sure bluetooth is enabled, then go into your Jot capable app. As of this writing, that’s sketchbook pro, PDF pen, and Inspire pro. Make sure you have jot touch enabled in the settings. Pushing the “A” (closest to the tip) button should activate. Is it cliche to do conference recaps? I don’t know. I feel like this might be useful for folks who don’t get to go, or have simply never been. So yeah. 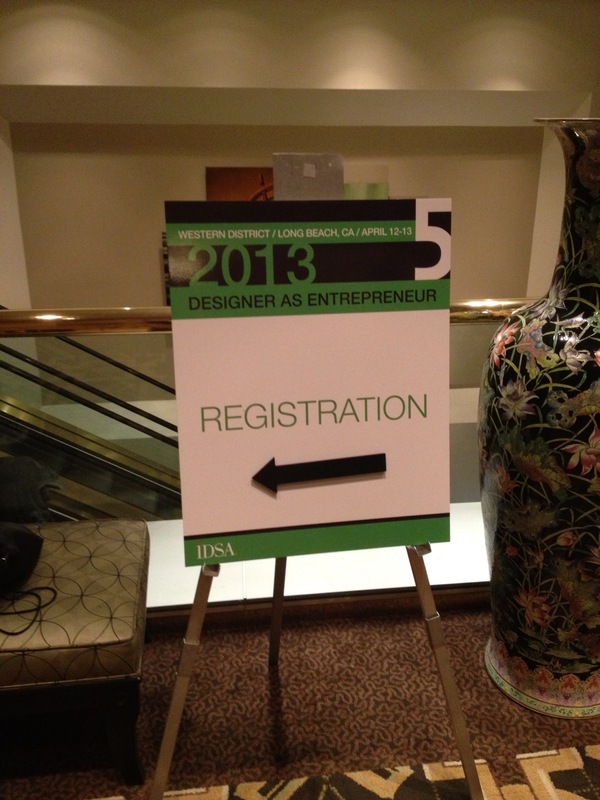 I live and go to school in Indiana, and as such typically go to the Midwestern IDSA conference. This year, the western conference has the theme of designer as entrepreneur, an idea which strikes my fancy as I’ve been studying entrepreneurship and plan to work it into my thesis, so I decided to hit this one too. As is customary, the vendor booths are the first thing I encountered. Rapid prototyping and short run options seemed to be more on display than usual with companies offering some new processes like pressure formed plastics and a kind of pseudo investment casting aluminum process. There was also a booth from “slippynotes” a post-it like product that can be reused like a white board, and slid around the wall. Software was also represented with the SolidThinking crew repping their Evolve and Inspire applications, Luxion showing off the new Keyshot 4 and Autodesk with their new cloud meets T-splines “360” product. look – a Purdue Alum! Designcraft was in the house as usual, with some toys. This year some acryllic “build your own cars” which replaced last years ARPY’s. The conference got rolling with the student chapter officer orientation program meeting led by Jose Rivera-Chang, followed by a portfolio review session. Next up was a great talk from Dario Antonioni covering ways to fund your projects with OPM. (other people’s money) Next, Jason Belaire led a panel discussion on portfolio practices. Finally, Erick Millan discussed his philosophy for designing for pets. The night closed with a post party at Dash dot. Tasty food and networking. Looking forward to tomorrow’s talks.